A data warehouse stores materialized views of data from one or more sources, with the purpose of efficiently implementing decision-support or OLAP queries. One of the most important decisions in designing a data warehouse is the selection of materialized views to be maintained at the warehouse. The goal is to select an appropriate set of views that minimizes total query response time and the cost of maintaining the selected views, given a limited amount of resource, e.g., materialization time, storage space etc. 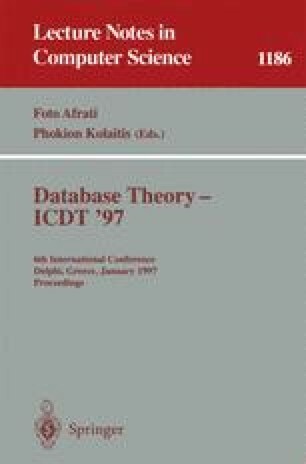 In this article, we develop a theoretical framework for the general problem of selection of views in a data warehouse. We present competitive polynomial-time heuristics for selection of views to optimize total query response time, for some important special cases of the general data warehouse scenario, viz. : (i) an AND view graph, where each query/view has a unique evaluation, and (ii) an OR view graph, in which any view can be computed from any one of its related views, e.g., data cubes. We extend the algorithms to the case when there is a set of indexes associated with each view. Finally, we extend our heuristic to the most general case of AND-OR view graphs.